The New York City apartment I share with my boyfriend is a clean slate - totally unfurnished, white walls throughout, and newly polished wood floors. When it comes to furnishing the place, like every young professional couple who is just starting out, there is this eternal battle between spending more money in pieces that will last or reverting back to the college years where the entire apartment is furnished by Ikea. Obviously at this point in my life where my college years are long past me and I've finished graduate school, the young adult side of me prefers not to have an entire apartment furnished by Ikea (not that I don't love Ikea I do, but instead I prefer it in smaller doses now-a-days). Which brings us again to the age old question again - to splurge or not to splurge? I'm actually in the middle - I'm always on the lookout for deals that give me the "best bang for my buck," and a quick Google search lead me to flash sale home goods & decor sites. 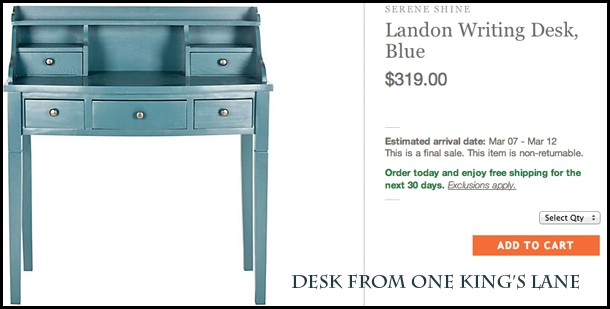 Below we have a desk from one of the flash sale sites, specifically One King's Lane. The site is selling it for $319 plus you have to usually pay shipping (around $9.95) for your first purchase. Next we have the same EXACT desk from Wayfair, except it's selling for $100 dollars less at $218 and the site offers free shipping. Oh, and you might have also noticed that One King's Lane does not allow you to return the item, but Wayfair does. 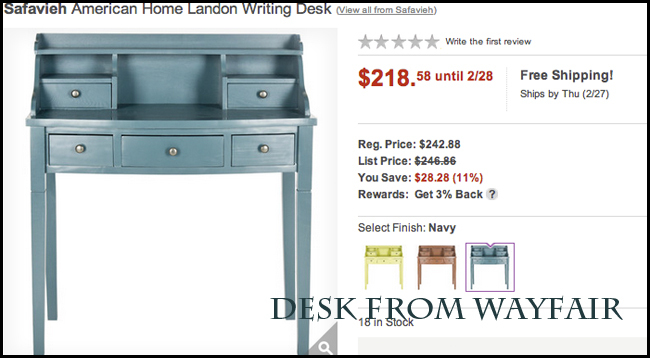 Desk from Wayfair retailing for $218 and shipping is free! Get it here. Yikes. That's pretty terrible. This isn't the first time I've seen One King's Lane (or another flash sale site for that matter) mark up the price substantially. I actually bought a vintage ceramic Chinese Guardian Lion (or commonly known here in the west as "Foo Dogs") on Etsy for $40 only to see One King's Lane sell the same exact one for over $100. Gilt, one of the first flash sale sites ever established, is also somewhat notorious for "inflating" the retail price so the discount looks more steep. The lesson to be learned here is that flash sale sites aren't always going to give you the best deals (even though that's what they claim to do). It's still up to us as consumers to be smart and to thoroughly do our research before making a purchase on sites like these. That being said, I've consistently found that Wayfair, Amazon, and Overstock offer the best prices, usually offer free shipping, and allow you to return the item if you don't like it. I am also not against buying second-hand or thrifted items, but that will be saved for another post! Hope you found this helpful & remember to shop smart!